Use this method to replace an image by another image that is already stored in Enterprise. Step 1. Display the article in Layout view. Step 2. From the Tools panel, select the Position tool. Step 3. Make sure that no frame is selected. Right-click the image in the Smart Connection panel or Dossier panel and choose Place. The image is loaded into the 'place cursor' of InCopy (also known as the 'place gun'). Step 5. Click on the frame into which you want to place the image. Use this method to place a local file into a Planned Image. During the process, the local image is uploaded to Enterprise. Planned Images are empty graphic frames which exist as a file in Enterprise. They are created in InDesign and are meant as placeholders in which the actual image is placed at a later stage, for example by an InCopy user. The frame of a Planned Image can be distinguished from other frames on the layout by the horizontal and vertical lines. Step 3. Select the frame into which the image should be placed. Step 4. Place the local image by choosing File > Place or by using the keyboard shortcut Cmd+D (Mac OS) or Ctrl+D (Windows). The Check-in dialog box appears. Step 5. Type a descriptive name and set the properties of the file as needed. The image is saved in Enterprise and placed on the layout. The option to make it possible to place images in InCopy has not been enabled. Contact your system administrator. Use this method to revert any changes that you have made to Smart Image image captions and to apply the original content and styling. 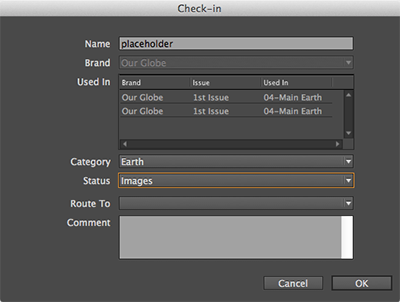 In InDesign, the Smart Image functionality of Smart Connection allows the designer to automatically add credit and/or caption frames to an image when that image is placed on the layout. The frames and their content can be automatically styled by applying paragraph styles, character styles, or object styles. The text that is placed in the frames is taken from the image’s metadata stored in Enterprise. Smart Image helps the layout designer to consistently place images and their credit and caption frames in the same style. If the designer chooses to make these caption and/or credit frames part of an article, then the content of these frames can be edited in InCopy, just as any other regular article component.